Mistah Kurtz? He not dead. He got him an art gallery in Zurich. Needless to say, Cotter’s generalization was of the entire art word of which Frieze is a part, and it is sadly accurate. Through a set of gradual increments in presentational etiquette taking place over the span of the past 20 years, contemporary art has evolved into a rather bizarre epiphenomena of the financial services industry, meaning that it has recently become of much greater interest to bankers than to philosophers and poets. That much is now certain, but what also remains as another even more disturbing possibility is how the global art world may now in fact be operating as a self-funding NGO (i.e. 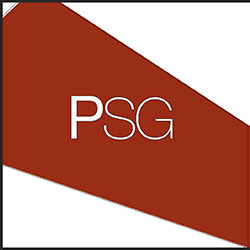 non-governmental organization) of surprisingly vast and far-flung proportions, one that is subtly designed to facilitate transnational discourses of strategic distraction and pacification so as to lubricate corporate access to global resources, markets and optimally profitable sovereign debt-to-equity ratios. Obviously, that is a topic for another much more fully researched article, but its value here lies in the way that it haunts the current object of critical consideration, that being the 43rd iteration of Art Basel; and here I mean Art Basel in Basel, Switzerland, not the junior version that takes place every November-December in Miami. Despite charging visitors 35.00 Euros for entrance, and charging the presenting galleries a hefty fee for their shares of floor and wall space, it still boasts a vast dance card of corporate underwriters headed by UBS, a Swiss megabank that also underwrites special editions of the Art Newspaper, which reports on daily events related to the fair. In that publication, we read that that Art Basel is also picking up a 60% stake in the Hong Kong Art Fair (this time underwritten by Deutchebank rather than UBS). The Dubai art fair seems to have no big bank affiliation, but is instead underwritten by global luxury goods purveyor Cartier. I bring this up because the latter has reportedly outdone Art Basel in terms of actual net sales during the past five years. I leave you to ponder what this statistic might actually mean, if anything. Nonetheless, with its assorted VIP lounges, security checkpoints and large fleet of sleek limousines stationed outside on standby alert, we can surmise a few important things about Art Basel. Yes, it is big in the fully resonant wowie-zowie sense of the word, containing almost 300 galleries, each presenting well-designed group exhibitions within 50 square meter cubicles wedged into the Messeplatz exhibition center. The staggering aggregate effect was one of seeing every object ever featured in a full-page Artforum ad during the past 20 years made uncannily real in brightly lit labyrinths of white walls, VIP lounges and undulate mobs of bemused gawkers. The general drift of presentations went from the edgier side of the “modern masters” category to the blue chip realms of curatorially sanctified “important contemporary art,” with a decided tilt toward works represented by European and American galleries. Price tags were almost always absent from the labeling of the art works, confirming the “if-you-have-to-ask, you-can’t-afford-it” ethos of the event. There were a lot of youngish people attending the event, proportionally speaking, many more than could be found at Documenta (which has no VIP lounges, methinks), proving that even high-end fantasy shopping is now deemed hipper by the Facebook crowd than is engaging the more intellectually demanding biennial-type exhibitions, even though they usually cannot gain admittance to Art Basel’s many VIP lounges. And that’s the point where things start to get a bit strange. For example, there was a solo show at the New York-based Tony Shafrazi Gallery of works by Tony Shafrazi. These were brightly colored plasticine objects whose surfaces sported mélanges of digitally manipulated images that faintly echoed Robert Rauschenberg’s post-1960 work, only with a sugar-coated highly fluorescent chromaticism. Zurich-based Hauser & Wirth had major works by Pipilotti Rist and Paul McCarthy, while New York based David Zwirner gallery featured works by Adel Abdessemed that were made from crushed aluminum cans to look like West African folk art with an anti-consumerist twist. 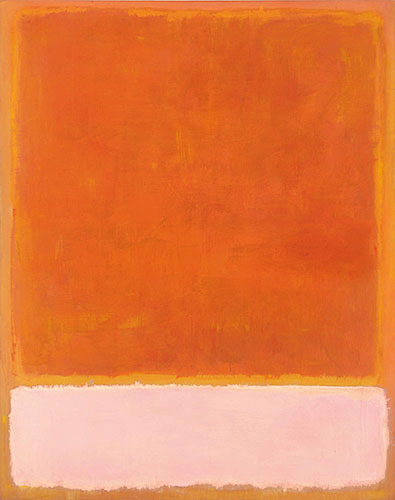 A 1954 untitled work by Mark Rothko at the Marlborough Gallery was most likely the highest priced offering at the fair, fetching an estimated 75 million dollars, according to Forbes, which posted the first review of the fair. If you knew the circumstances surrounding Rothko’s 1970 suicide and subsequent bloodbath of estate litigation, you might find this fact a bit ironic, but that irony was lost in the article, which like those in the Art Newspaper or the Financial Times, was all about price points and pseudo celebrities. That said, I must also point out that the above-mentioned Rothko work mentioned here was and no doubt still is as visually rich and affecting as any that I have ever seen, including those already in museum collections. 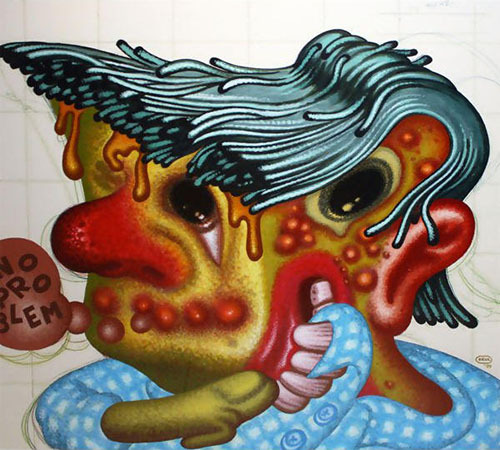 Peter Saul: "No Problem," 1999, acrylic and colored pencil on paper 40 x 42"
Paris-based Gallerie1900-2000 was offering a stunning selection of Surrealist works from the 1930s and 1940s, including several choice exquisite corpse collaborative drawings as well as the creepiest painting by Victor Brauner that I have ever seen, one that uncannily prefigured the early Pop Surrealist works by Peter Saul, who incidentally also had a stunning painting on view at Richard L. Feigen. McKee had four late Gustons, while a nearby emporium had a truly choice Miro from the late 1920s. I also saw a Francis Bacon self-portrait, a Hans Bellmer pervo-doll from the late 1930s, a Lucio Fontana slash painting, two pivotal mid-1960s sculptures by Anthony Caro, a choice set of mid-1970s suites of conceptual photographs by John Baldessari, early 1980s works by Keith Haring and Jean-Michel Basquiat, and a suite of large ink drawings by Kara Walker. Michael Krebber’s intentionally unfinished abstractions were at the Berlin-based Galerie Buchholz, and in the Art Basel context they are now starting to look quite finished, in both senses of the term. 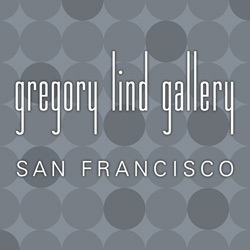 Noteworthy works by California artists included a sweet pair of small recent paintings by Lari Pittman, a trio of mid-1970s works by Wally Hedrick at the London-based James Mayor Gallery and several works from several phases of Bruce Connor’s career, as well as two late-1950s paste-ups by Jess. It is also interesting to note that large school-of-Becher photographs seemed almost completely absent from the highways and byways of Art Basel, suggesting a belated sea change in the art market’s over-valuation of such things. This might seem like an invitation for Marxist simpletons to start screaming “commodity fetishism,” or it might seem like another invitation for slightly less simplistic neo-Marxists to start screaming “spectacle,” and indeed, both sets of claims are true up to a point. But they also miss the more important and vastly under-discussed point. Even though the putative commodities are bathed in enticing baths of professionally designed lighting, and even though the sheer size of Art Basel confirms its status as a major spectacle, the important takeaway is that its offerings are not really luxury commodities any more than does the fact of their location in a grand spectacle makes them exercises in social distraction. At its core, Art Basel is best understood as an immense array of financial instruments pretending to be those other things. 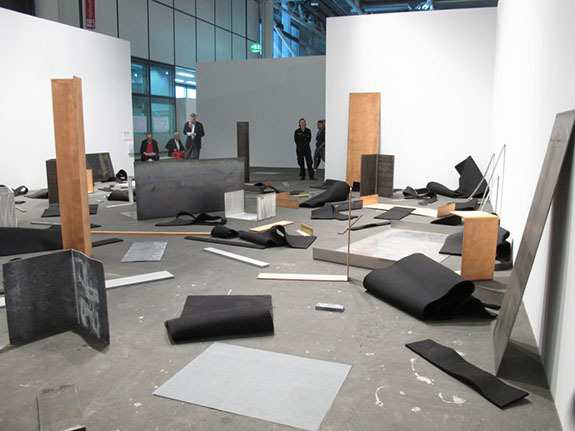 What Art Basel does is demonstrate how the normative art economy actually works. 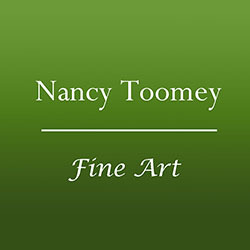 Here is the model: An artist makes a work of art and shows it at gallery, which gets it reviewed by a critic which results in its sale to a collector. The collector hangs on to the artwork while the reputation of artist rises by repeating the same machinations described above, and then, at a fortuitous moment, she either sells said artwork for a profit, or more normally donates the artwork to a museum, for which she receives donor recognition, which represents the fair market value that the museum places on the artwork. Because the work has been accepted into the museum collection, its fair market value automatically rises, so that donor recognition is actually worth much more than the original purchase price. And it is donor recognition that the collector claims as a tax-deductible contribution, a dispensation supported by the U.S. and most European nations. The value-added portion of this equation lies in how much greater a sum of money donor recognition represents in relation to the original cost of the artwork, and in many cases that sum is ten to one hundred times the original investment. 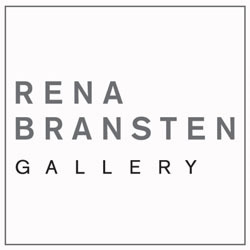 Thus, the operational economy of art is laid bare, and it can rightfully be called a speculative marketplace in objects that might represent a significantly enhanced tax-deductibility that can be exercised at some future juncture, all assuming that a museum is interested in acquiring said work of art. 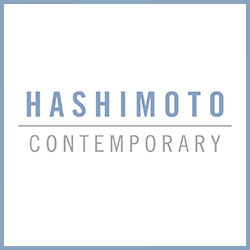 This means that the work of art has to fit in with what a museum considers a worthwhile esthetic experience, which is based in part on its own vested interest in perpetuating its ability to exercise such consideration. Seen in this light, Art Basel can be viewed like the trading floors of the NASDAQ or the Chicago Mercantile Exchange. But there is even more to it than that, because, like any major circus, Art Basel not only has a main center-stage event, but also some compelling side shows that have been recently added. Two in particular seem worthy of remark, in part for how they recast the practices of temporary installation and performance art as being frivolous pendants to the above-mentioned art economy, subtly dismasting their pretenses of being “socially engaged” alternatives to it. One of these was Art Unlimited, ensconced in a separate pavilion at the Messeplatz Center. It consisted of 62 separate solo presentations (sponsored by many of the same galleries that were wheeling-and-dealing in the main exhibition hall) that more often than not were site-specific installations that were given much more breathing room than were the works in the main exhibition hall. Here we had some big names, such as Bruce Nauman and Art and Language, as well as some relatively recent arrivals on the scene of big time Euro exhibitions. 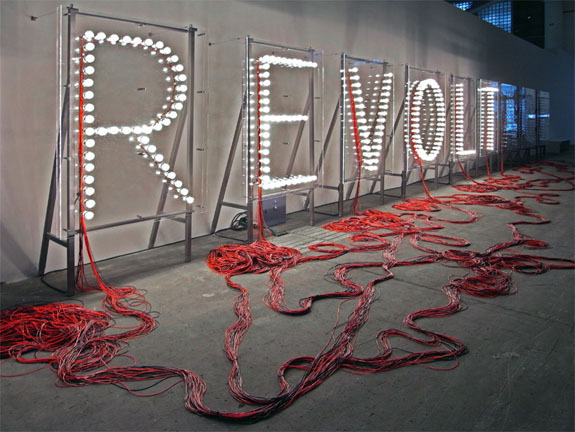 For example, the Raqs Media Collective presented an installation that featured giant flashing neon signage (seeming a bit like an early Nauman), while nearby there was a spare and elegant installation by Richard Wentworth made of dangling chains. Gilbert and George: "Hunt", 2011 mixed media, 119 x 100"
Naturally, there was a huge and unsightly sculpture by Franz West, he being the artist that for some inexplicable reason just has to have work in every major European exhibition. There was even a canny restaging of Robert Morris’s “Scatter Piece” from 1968, as well as large a large photomontage by Gilbert and George. But I am here to tell you that the real prizewinner at Art Unlimited had to be Richard Jackson’s colossally scaled sculpture of a giant pig with cartoonish geometricized features, a presiding spirit if ever there was one. The cut and trim of this object’s craftsmanship was stunning, as was its bright pink coloration. 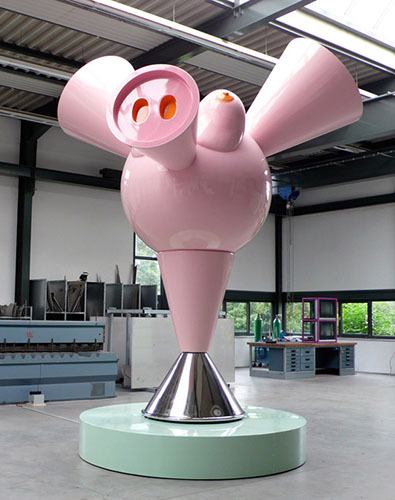 The Art Parcours, located across the Rhine in the St. Johann neighborhood, was yet another aspect of Art Basel. 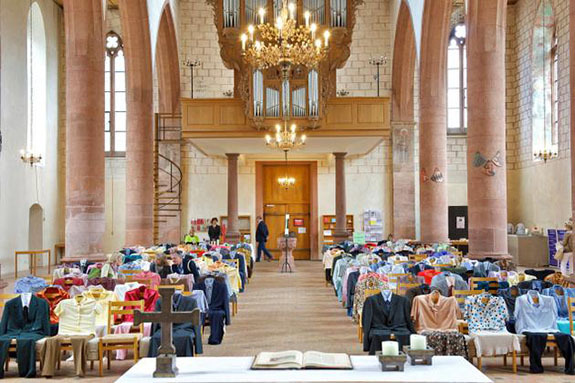 Curated by Jens Hoffmann, this mapped sequence of 13 site-specific installations and performances in various pubic spaces, included Prediger Church, which was transformed by Los Carpenteros into a memorial for the socially underrepresented, with down-market clothing draped across its altar-facing chairs. 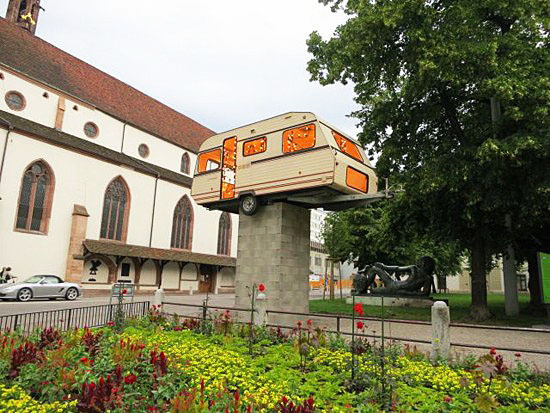 Across the street in St. Johann Park, there was a camping trailer perched on a tall pillar of cinder blocks. Positioned inside the trailer were five star-shaped light fixtures, making for a stunning after-sundown viewing experience. The untitled work was by Claude Lévêque, and it showed how the world of site-specific public art production is being slowly incorporated into the larger art economy as sideshow entertainment. The most interesting of the Art Parcours installations was by Dieter Roth, which took over the upstairs of a building to set up not one but two very different studio workspaces side-by-side within it. One of these was a rather typical artist’s studio, with grungy furnishings made out of recycled plywood that were configured around work stations for various forms of traditional studio production, including a small office and kitchen area. No doubt, this was the side that somehow represented the second half of the 20th century, and that was made clear by the other workspace, which was a series of high-end computer workstations with various accoutrements (i.e. software manuals etc.) that revealed their dedication to architectural tasks. Initially, I thought that they might represent the host of administrative tasks that go into organizing big exhibitions like Art Basel, creating a comic tableau that maximally contrasted the world of art production and art administration. But either way, the work conveyed a clear archeological message about the material gulf between the last century and our own. A bit obvious perhaps, but in its tangibility and intelligent attention to subtle detail, it still served as a pointed welcome to the future that is now. Basel plays host to three other art fairs during the week-long Art Basel festivities, those being Scope, Volta and Liste. Long story short, I skipped Scope and Volta, because I didn’t have time to do otherwise. But I did make it to Liste 17, which was billed as “The Young Art Fair” as a way of casting Art Basel as old news for old people—rich old people. 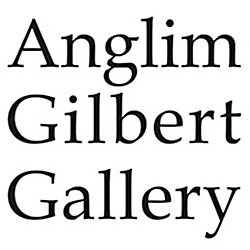 It is indeed young, allowing galleries that have only been in business for less than six years to participate, and insisting that they only show the work of artists who are under the age of 40. Sixty-four galleries from 22 countries made the cut from an initial pool of 350 applicants, these being augmented by a robust playbill of performance events that were staged at the fair. Unfortunately, very little of this vast preponderation made much of an esthetic argument for the reasons why artistic youth needs to be served as anything other than something that accompanies a fine sauce. In other words, Liste 17 turned out to be a rather depressing mimic of the event to which it pretended to be an alternative, substituting IKEA gallery furniture and humble hipster outfits for the tonier Armani worn by the hedge-fund sharks circling the reefs at Messeplatz. In other words, rather than actually embracing the particularities of youth culture as a set of unique cultural modalities demanding their own mode of audience interaction, the artists and gallerists at Liste came off looking like a phalanx of precocious tweens donning their parent’s clothes to do a bad pantomime of adult manners without demonstrating much thought as to whether or not those manners might in some way be corrupt. These seemed to be indistinguishable with market manners excepting for the substitution of more affordable price points for smaller and more derivative works that have only the slimmest chance of being deemed collection-worthy by any real museum. Of course, there is always the chance that one out of twenty or so will pan out, and like the OTCBB market for penny stocks, there is the lure of major reward for getting lucky with the perfect purchase executed with perfect timing. And for that reason, sales at Liste seemed quite brisk, occasionally registering price points that reached beyond the lower-middle four figures. This made me think that someone should start an art department in an institute for the study of casino management. 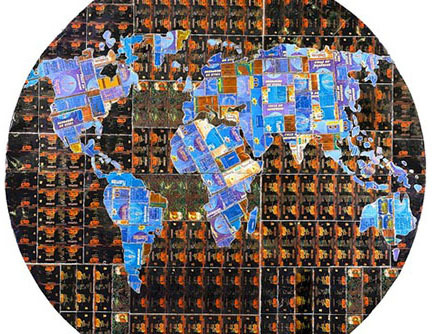 Given that the art fair-heated art market has been in a steady state of global expansion even through the 2008-09 financial crisis, it might be that someone already has done so. Every year since 1996, Liste has taken place at the Warteck brewery building that overlooks the Rhine in Basel’s Burgweg district. The building itself is an amazing place with a fascinating history. After it ceased functioning as a brewery in the early 1980s, the city gave it to an array of artists and arts groups, who initially developed the Liste concept (with funding from the Basel banking firm of E. Gutzwiller, CIE, which has supported the event ever since). It is full of antique fixtures and unpredictable ramps in its six rabbit-warren floors, creating a delightful synthesis of steampunk and Art Deco stylings, and also creating challenges for the exhibiting galleries to make their wares visible. No doubt, it is a world-class party venue, but it does create problems for art in that it makes it almost impossible to see anything in particular apart from the general experience that surrounds and engulfs it. Only one artist presented work that clearly stood out from what otherwise looked like a run-of-the-mill MFA exhibition, and that was Pedro Reyes, at Mexico City’s Labor gallery. 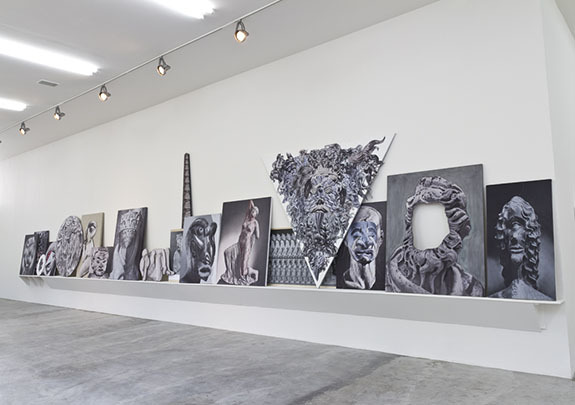 His installation of overlapping grayscale images, How to Get Over Your Fear of Painting, executed on irregularly corrugated surfaces, was accomplished and philosophically mature in a way that rewarded the attention of sophisticated viewing. Many of the other works were studies in under-baked understatement, obliquely in keeping with the current vogue for so-called “Provisional Painting,” but only in a way that appropriates the look of such things without seizing upon any specific intent to be anything other than vaguely enigmatic. The result was far too many works that included snippets of enigmatic text juxtaposed to ghostly photographs or random scrawls, or, in another register, pseudo-childlike exercises in “expressive” figuration that seemed too closely derived from street art. In short, the esthetic tenor lurched heavily in the direction of simple algebras of hashtags and emoticons, those being the international lingua franca of “young art.” The fecklessness of much of it became numbing rather quickly, which might be its point. It is art in the age of financial instrumentality, which means that, if we wonder how or why it might fail to serve as any meaningful model for the organization of experience, we can answer that the art fair art conceded that function long ago. The reasons for this concession are many, but the real culprit is the failure of critical nerve masked by a brand of cheap perfume called “post-criticality.” Many years ago, Thomas Hess once wrote that the contemporary art market had become successful by “killing the artist with kisses.” Allan Kaprow followed suit by saying that in the 1960s, “hippy journalists” had become the chief enemy of art. Both of these statements point to the ways that over-indulgence stunts artistic growth while also creating a dilution of any specific esthetic experience. It is not that we need to worry about the economy of contemporary art being some kind of bubble, because bubbles come and bubbles go, and as savvy investors know all too well, markets can be irrational much longer than people on the wrong side of any trade can remain solvent. And it is not that all of this takes place under the sign of newly-metastasizing bank wealth, because as we all know, even the Medici were a banking clan, and art flourished during their time. But the reason for that was five centuries ago, art was deemed necessary for the laundering of usurer’s guilt, while in our own gilded and guilt-free times, nothing really matters beyond sustaining the pretense that it is all supposed to matter. And to that we might now add the universal preservation of undeserved self-esteem. 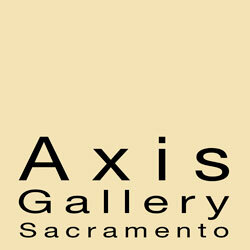 Mark Van Proyen is an Associate Professor at the San Francisco Art Institute. 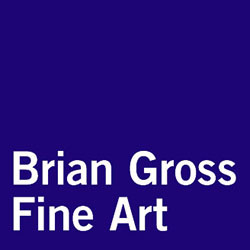 He is a corresponding editor for Art in America, and his critical writings have appeared in many publications, including Art Criticism, Artweek and Art Issues. 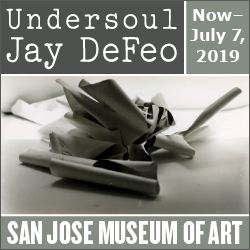 The author wishes to gratefully acknowledge a faculty development grant from SFAI, which supported the research for this essay. Thanks for the very interesting,intelligent, and provoctive article.